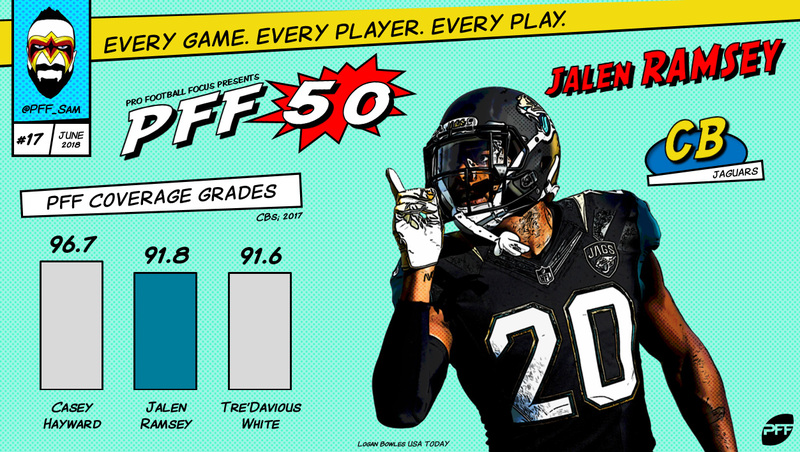 At the end of each season, Pro Football Focus brings you the best 101 players of that year based on the grading, but now that we are approaching the preseason of another new NFL season, we are going to look instead at the best players in the game overall right now. 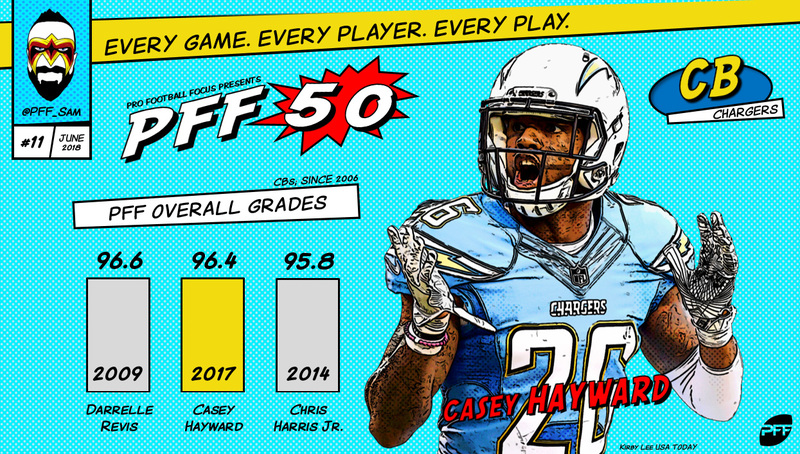 Rather than confuse matters with another list of 101 players, we have cut it down to the best 50 players in the game as we head into the 2018 season, chosen by the PFF team and informed by grading, statistics and schematic context. 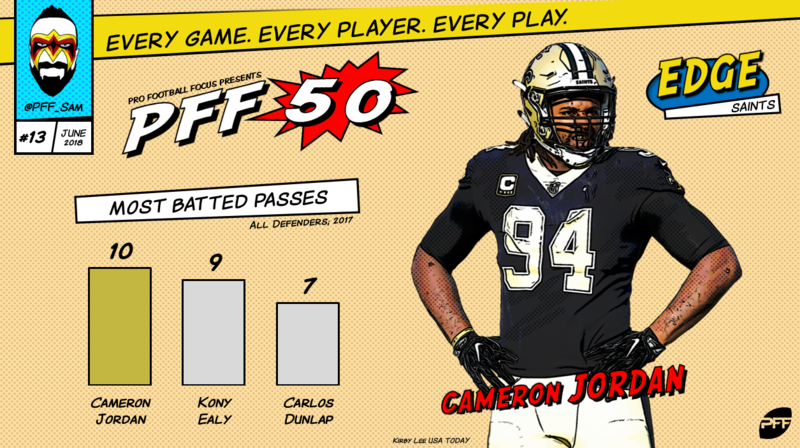 We’ve unveiled the names one at a time on Twitter (follow @PFF), 10 a night, starting Monday and running through Friday while also counting them down here. Follow along on Twitter and/or track the countdown here all week up until Friday, when we’ll unveil the top 10 players heading into the 2018 season. Green’s performance has declined in line with that of his quarterback, Andy Dalton, but he remains one of the best receivers in the game. He has receptions of at least 70 yards in five of the past six seasons and just 16 drops over the last four years combined. 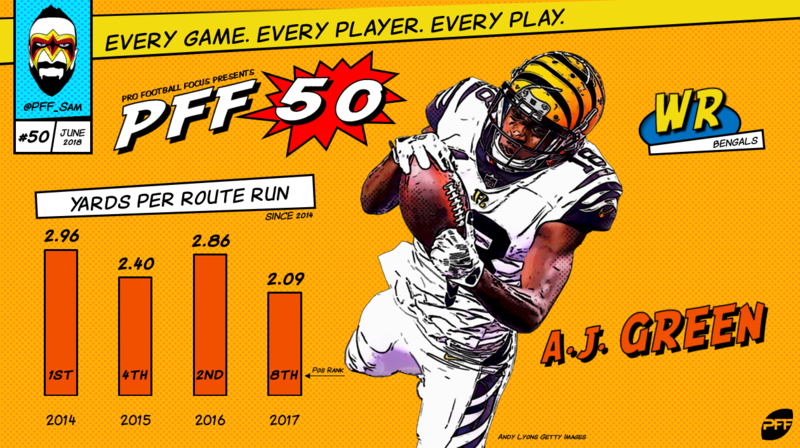 Green had ranked in the top five in yards per route run in three consecutive seasons before 2017, leading the entire league back in 2014, when he and Dalton were at their best. There was no better evidence for the impact Kelce can have than what happened to the Chiefs the moment he got injured against Tennessee in the playoffs this past postseason. The Chiefs were dominating that game but failed to score again after the loss of one of the best receiving weapons in the game, a true matchup nightmare for defenses. Kelce again led the league in broken tackles among tight ends (16) and has now forced 62 misses by defenders across his four-year NFL career, averaging 6.9 yards per reception after the catch. Joey Bosa and Ingram represent the best edge rushing duo in the league for the Chargers as Ingram notched 76 total pressures in 2017 to go along with Bosa’s 75. It was a career year for Ingram, who has seen his overall PFF grade improve steadily in each of the past four seasons, topping out at an outstanding 91.9 mark. Who knows if there is more yet to come, but right now Ingram has become one of the game’s most consistent and formidable pass-rushers and has the added benefit of a partner-in-crime to keep some of the attention away from him. Beckham Jr. showed everybody what he was capable of as a rookie and that overall PFF grade of 93.0 remains the best mark of his career. It also sits in the top 10 of all single-season grades we have given a wide receiver since we have been grading every player on every play of every game in the NFL season. OBJ’s grade has declined each year since that season but was still excellent before his injury-hit 2017. He has as much talent as any receiver in the game and has broken 62 tackles after the catch with the ball in his hands over his career, despite that injury-shortened 2017. 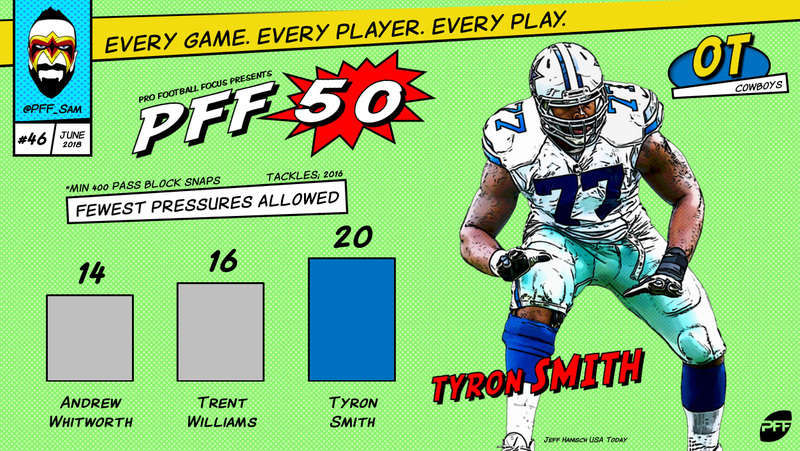 At his best, Smith is arguably the best tackle in the game, but injuries have become an ever-increasing spectre hanging over his career. It would be tough to head into the 2018 season absolutely certain we’ll see the best Smith we could see at left tackle for the Cowboys. His run-blocking hasn’t been as strong as we have seen from him since 2015 and he surrendered 21 total pressures despite missing time last year through injury. Since signing with the Atlanta Falcons, Mack has played the best football of his career with overall PFF grades of 88.7 and 88.9 topping anything we saw him do in Cleveland. 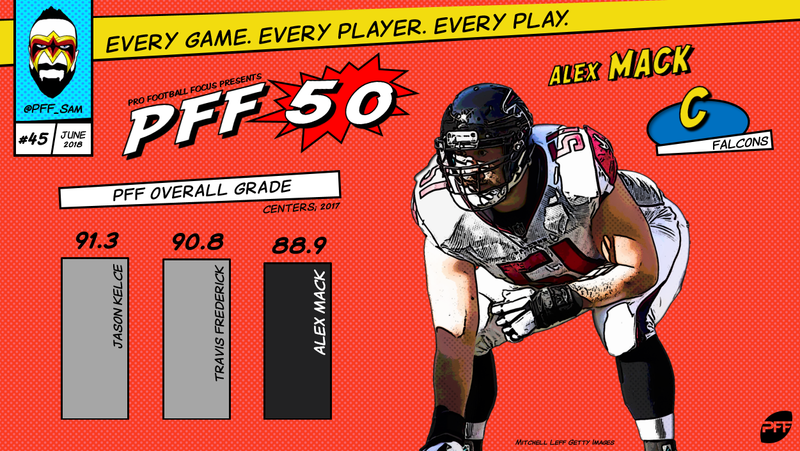 Mack has been instrumental in the Falcons’ resurgence as a rushing force on the ground and his ability to execute all of the blocks consistently and reliably in their zone-blocking scheme is vital to their offense. Last season, he surrendered just two sacks and 16 total pressures in the middle of that line. 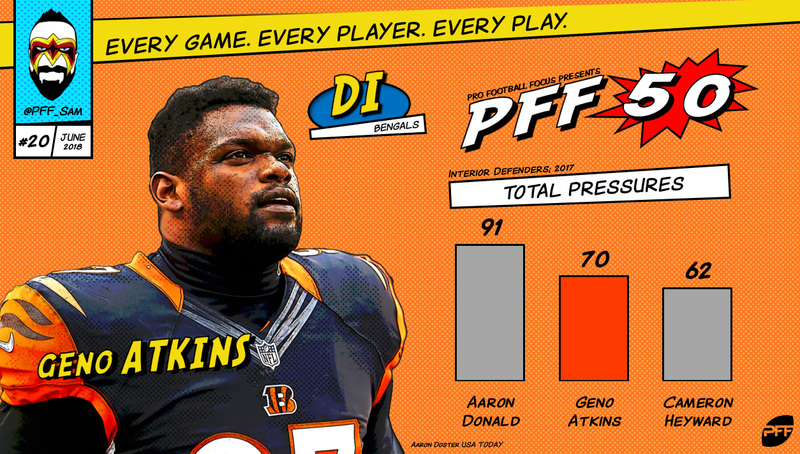 In a league that has become ever more pass-oriented, Harrison is still able to stand out as a run-defending monster. He once again led all interior defensive linemen in run-stop percentage (15.8 percent) – a statistic that might as well be named after him at this point. He has led the league in every season of his career after a rookie season that saw him play just 22 snaps. He has topped 40 defensive stops in the run game for three consecutive years and has as many seasons of 40-plus run stops as every other defensive tackle in the league combined since 2006. One of the league’s true iron men, Buckner has been in the league for just two seasons and has already seen 1,873 snaps of action on defense, and that’s after seeing his workload cut significantly from his rookie season. Add that to his college career in which he rarely left the field (1,923 snaps in his final two seasons) and you have a player with outstanding durability and capacity to produce despite a monster workload. 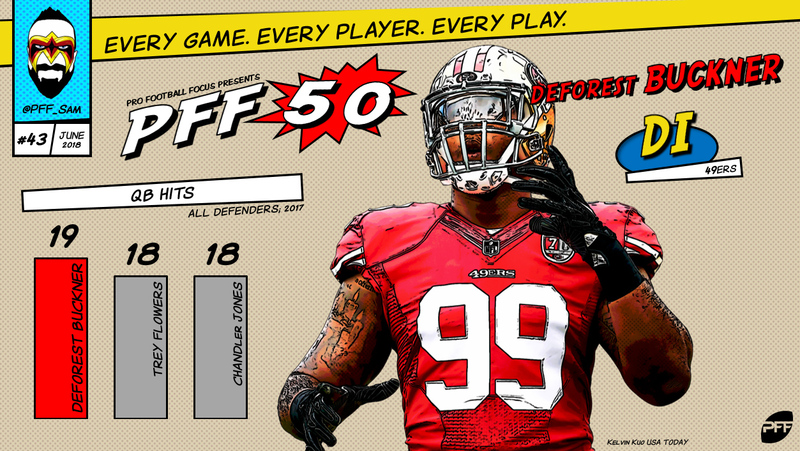 In 2017, he became a true force for the 49ers, notching 52 total pressures as an interior pass-rusher. He is a top-quality player on the rise. There are few seasons we have ever seen like the year Jackson III had in 2017 in what was effectively his first NFL action having lost his rookie year to injury. 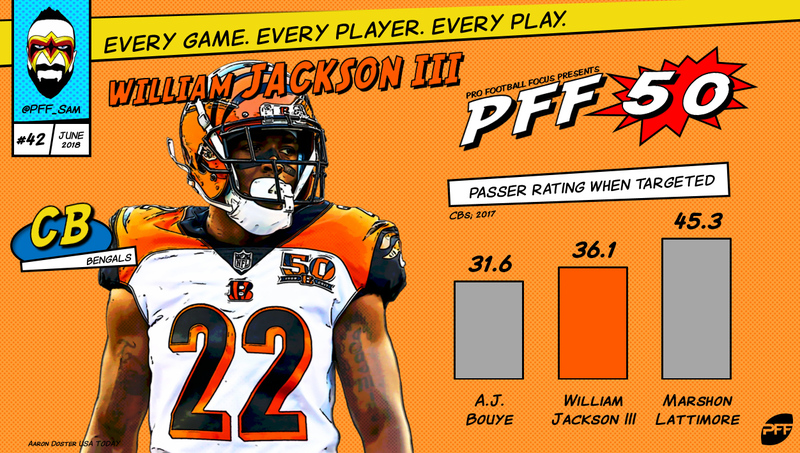 Jackson III allowed a passer rating of just 36.1 when targeted, lower than if the quarterback had just thrown the ball away every snap instead. He allowed just over a third of passes thrown his way to be caught (34.9 percent) and when covering Antonio Brown twice over the year, broke up four of the seven targets without allowing Brown to record a reception. He could be the game’s best corner with a repeat performance as an every-down starter in 2018. Bouye had a breakout 2016 season that earned him a big payday in Jacksonville before backing that season up with authority as part of the best cornerback duo in football in 2017. Bouye allowed a passer rating of just 31.6 over the season, the best mark in the game and only a relatively rough playoff run pulled his overall PFF grade away from the very best players in the league. He still finished with his second consecutive grade of 88.0 or higher and didn’t allow a touchdown all regular season. 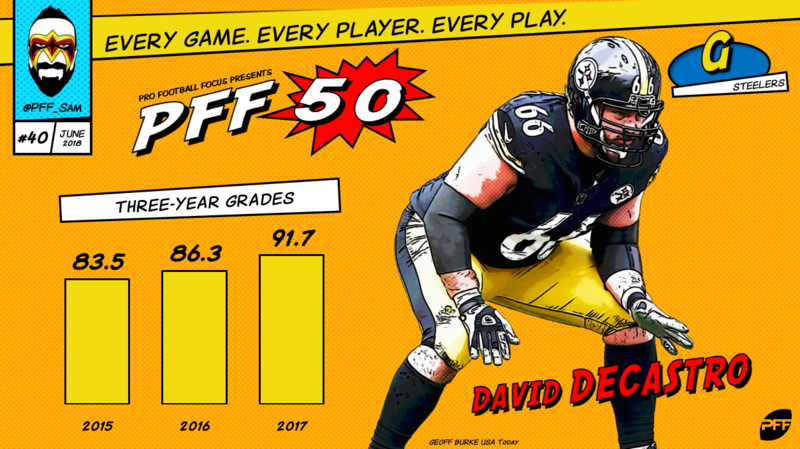 A former first-round pick, DeCastro has seen his overall PFF grade improve in each of the past three seasons, topping out with a 91.7 in 2017 that saw him earn our Matthews Award, given to the game’s best offensive lineman in a given season. DeCastro didn’t surrender a sack all season, allowing just one hit and 14 hurries, but it was run-blocking where he really stood out for the Steelers. The power with which DeCastro was able to drive defenders away from the point of attack either at the line or against linebackers at the second level was remarkable and who knows if his development has yet topped out. The second-highest graded receiver in the game in 2017, Thomas notched an overall mark of 93.0, trailing only Antonio Brown over the year. 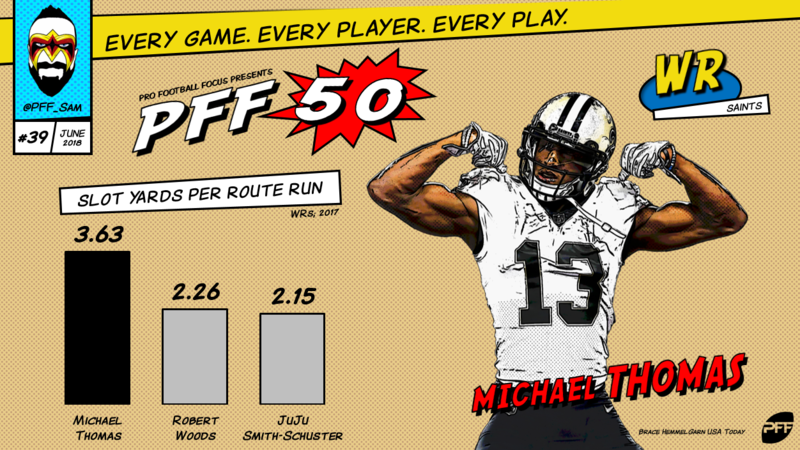 Thomas spent just 22.3 percent of his time lined up in the slot but led the league in yards per route run from an inside alignment, more than a yard per route higher than any other receiver (3.63). He has become a devastating weapon for the Saints and one of the favorite targets for Drew Brees, with 280 targets across his first two seasons. Injuries have cost Williams some playing time over the past two seasons, but over that span, he has allowed just two sacks. With the departure of Joe Thomas into retirement, Williams is another of the tackles on this list with a case to be known as the best player in the league at the position when he plays at his best. His 2016 season was the eighth-best single season grade we have ever given a tackle, with Thomas and Jonathan Ogden owning three of the seven better seasons. 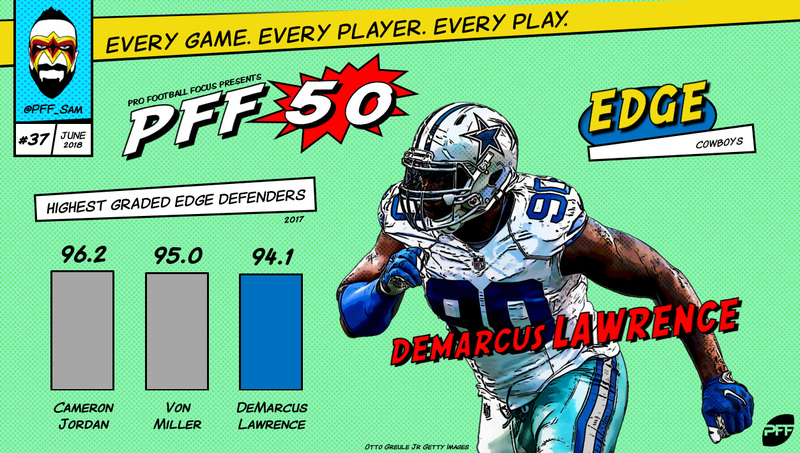 Finally healthy and in a contract year, Lawrence broke out in 2017 with a spectacular display of pass-rushing dominance on a defensive line in which he was the sole threat much of the time. Lawrence posted an overall PFF grade of 94.1, trailing only Von Miller and Cameron Jordan. He had 79 total pressures, which was second only to Miller’s 83 among edge rushers. Really the only thing keeping Lawrence this low on the list is the fact that we are working from just one year of proven quality, which was a contract year. If Lawrence backs up 2017 with another season of quality, he will vault up this list. 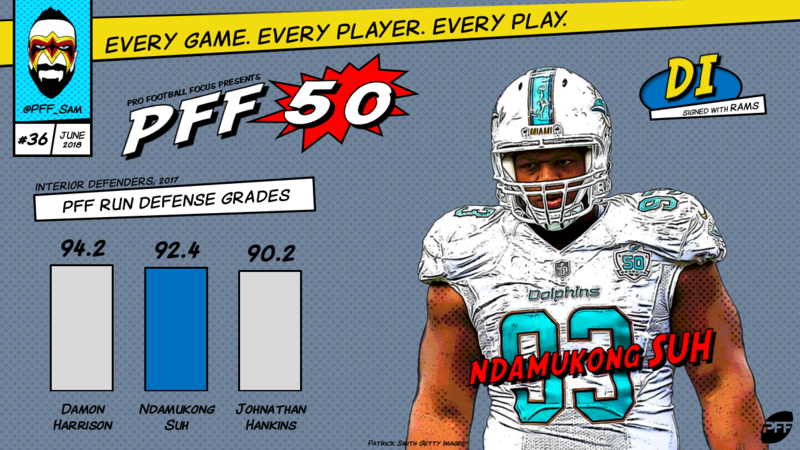 Suh signed a monster contract with the Miami Dolphins off the back of his rookie deal in Detroit and if anything, was even better during his tenure in Miami. His last three PFF grades (92.5, 89.3, 90.9) were all better than any single year he had with the Lions. Suh is dominant against the run and as a pass-rusher, and really the only flaw in his game is a monstrous volume of penalties on a consistent basis. He has 10-plus penalties in the last four consecutive seasons and 42 just in his three years playing in Miami. 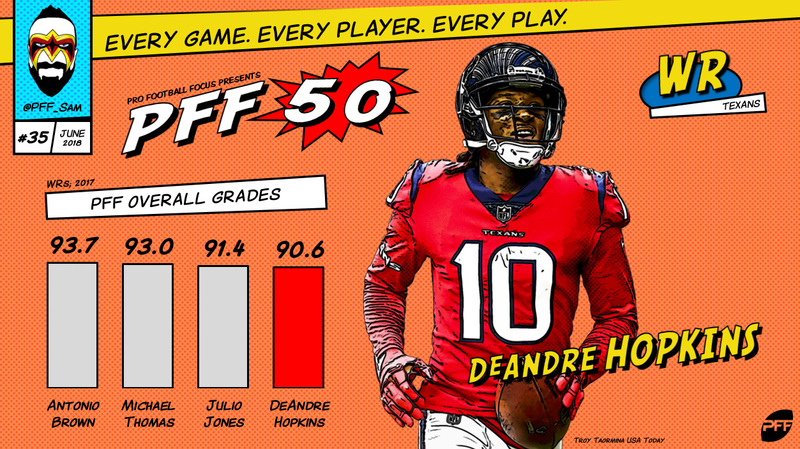 What Hopkins has been able to do with the disastrous quarterback situation in Houston (briefly broken up by a few games of Deshaun Watson) has been little short of spectacular. 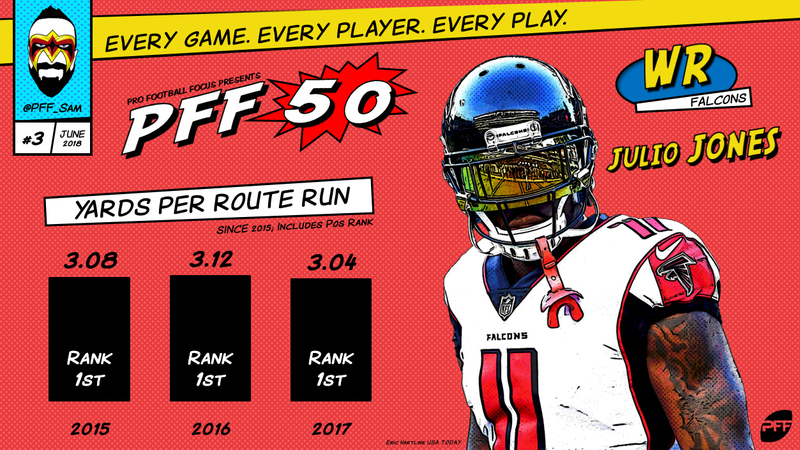 In the last three seasons, he has two overall PFF grades over 90.0 and had top 10 marks in yards per route each of those seasons. Hopkins has just 20 drops over his five-year NFL career despite some disastrous quarterback play, whose suspect ball location leads inherently to more dropped passes. Few quarterbacks have been asked to do more with less than Wilson over his NFL career. 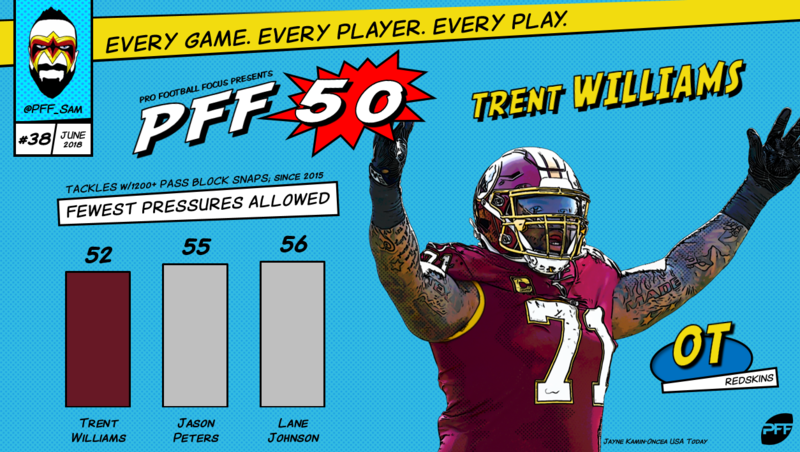 Routinely playing behind one of the worst offensive lines in the game, Wilson has been tasked with making their offense work whatever way he can and still consistently grades above 87.0 in overall PFF grade. Wilson has been among the most pressured passers in the game – leading in overall pressure rate again in 2017 at 41.4 percent – but ranked in the top 10 in adjusted completion percentage on those pressured throws. 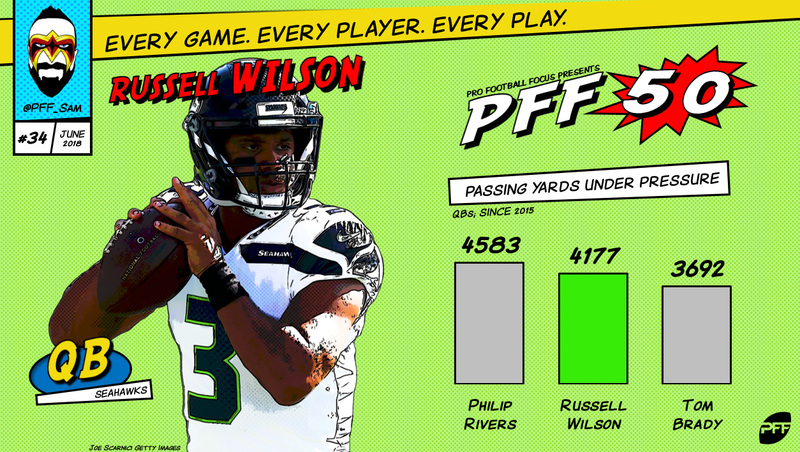 With a little more help around him, Wilson could do spectacular things. 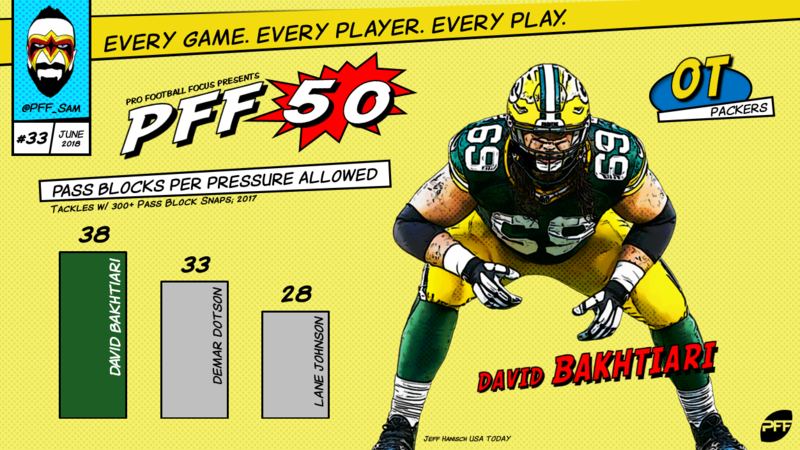 Bakhtiari has become the best pass-blocking tackle in the game, locking down Aaron Rodgers’ blind side for the Green Bay Packers. He led the league in pass-blocking efficiency in 2017 at 98.0, surrendering just one sack and 12 total pressures across 455 pass-blocking snaps. In 2016, he finished second, surrendering only 20 total pressures in 672 pass-blocking snaps. 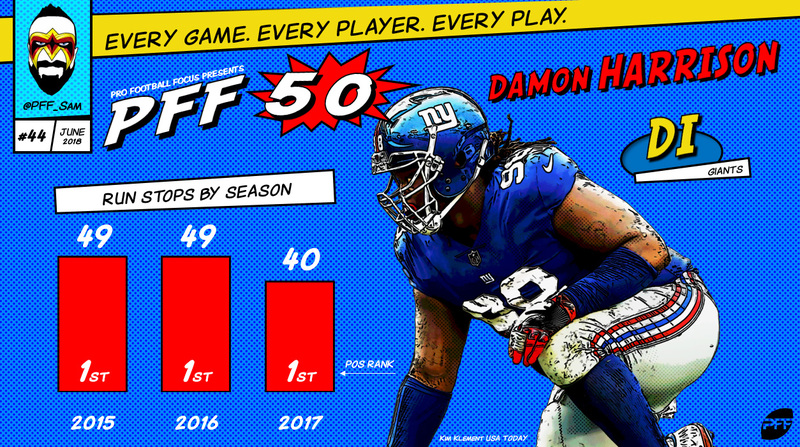 He has always been a good pass-blocker at the NFL level, but over the past couple of seasons has dramatically improved his performance in the run game, becoming a far more well-rounded player. 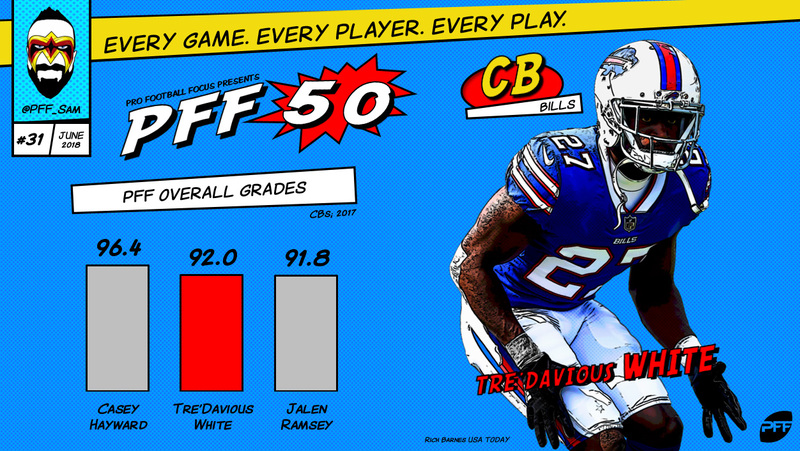 2017 was a vintage year for rookie cornerbacks, with both Lattimore and Tre’Davious White dominating in their first experience in the NFL after both excelled in the PFF system in college. 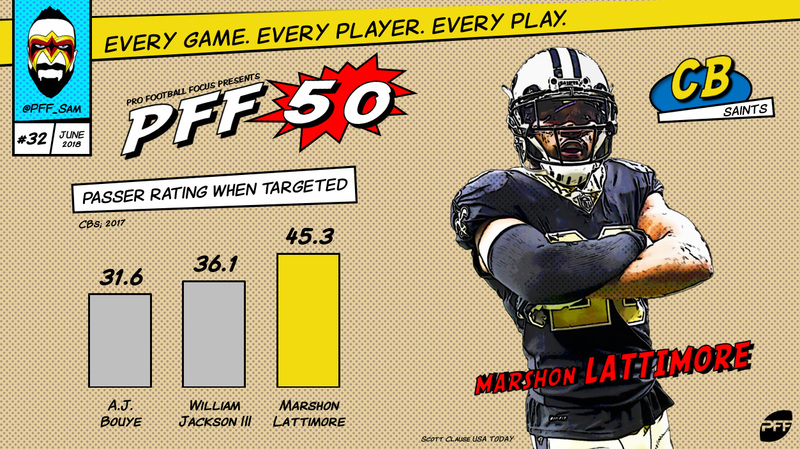 Lattimore did not surrender a touchdown all season and had five picks and 10 pass breakups from just 68 targets. He was good enough that he drew the assignment of covering Julio Jones 1-on-1 when the Saints ran up against the Falcons and could even become the best corner in the game with another step forward in development. While Lattimore got most of the attention, White actually earned the higher overall PFF grade (92.0 to 90.5) and coverage grade (91.6 to 90.5) among the two rookies. White allowed just 50.6 percent of passes thrown his way to be caught and became the No. 1 corner on the team on the eve of the season as the Bills traded away Ronald Darby and threw the rookie in at the deep end. White and Lattimore both look like the real deal. 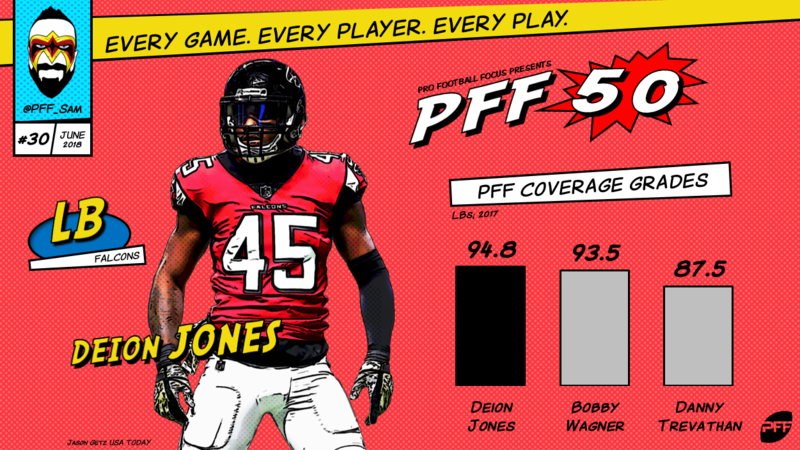 Last season, Jones was the best coverage linebacker in the game. 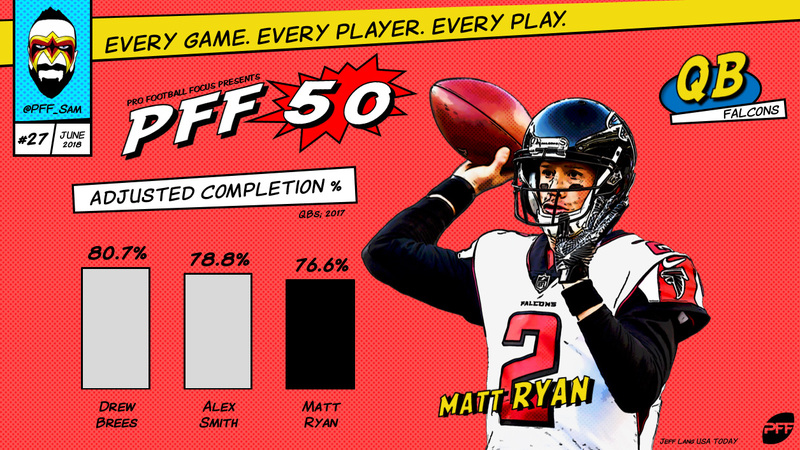 He was responsible more multiple game-winning plays on defense for the Falcons, including intercepting Drew Brees in the end zone to kill a comeback, eliminating Greg Olsen as a factor when Cam Newton needed him and even breaking up a pass in the end zone intended for Sammy Watkins in the playoffs against the Rams. Jones had three interceptions and six pass breakups to tie for the lead among all linebackers and if he can continue that form going forwards, he will remain a game-changing defender. 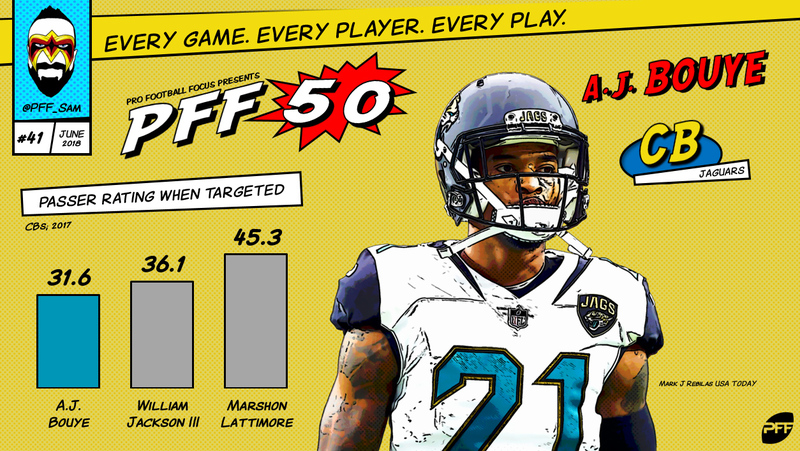 One of the best cornerbacks in the game has become the gold standard for defending the slot, which has become ever more valuable in today’s NFL. 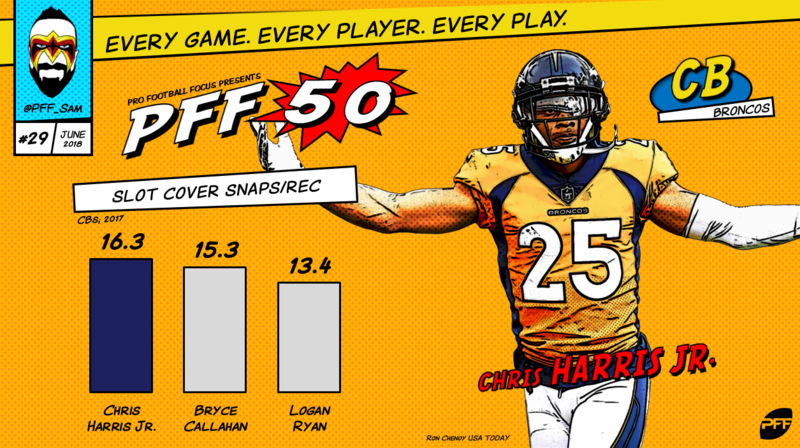 Harris went 16.3 snaps in coverage between receptions surrendered in 2017, the most in the league among slot defenders and has routinely been the hardest slot corner in the game to complete passes on during his time with the Broncos. He has three single-season PFF grades above 90.0 in his career and has never posted a mark below 80.0 in the NFL. It was almost a tossup between Ryan and Brees, though Ryan’s two-year sample was slightly better. Brees took a step back from a fantasy standpoint last year, but that was due to the help around him on both sides of the ball. He was the most accurate quarterback in the league last year while tying with Ryan for the second-best overall PFF grade. 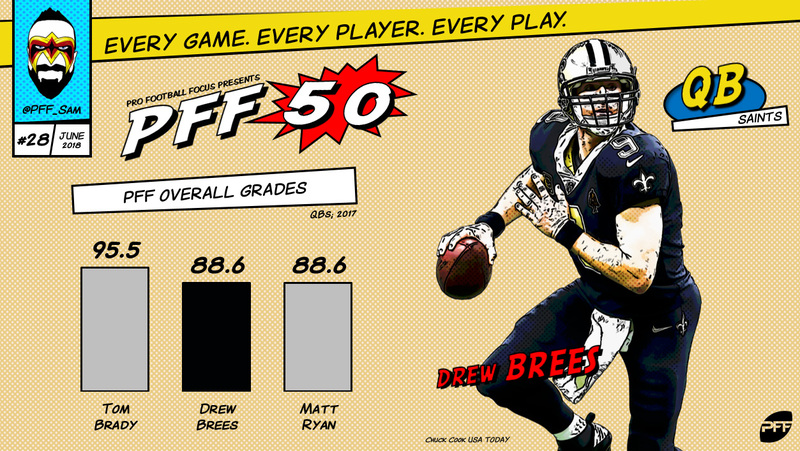 Brees can still get the ball down the field when necessary, ranking eighth in big-time throw percentage and posting the top accuracy percentage on 20-plus yard throws. While his overall play did take a step back from his 2016 MVP campaign, Ryan was the victim of poor luck in 2017, leading the league in avoiding turnover-worthy plays while ranking only 12th in interception percentage. He had another strong year throwing the ball overall, tying for second in overall PFF grade, while ranking third in adjusted completion percentage and fifth in our advanced accuracy data. Ryan remains a top five quarterback heading into 2018. 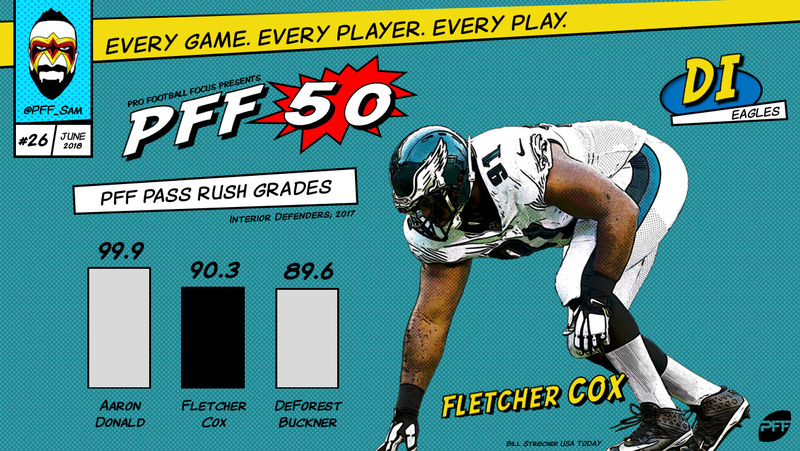 There may not be a defensive lineman in the NFL with more brute force and power than Cox. The Eagles interior stud has dominated even the best offensive linemen and was the only player to give Zack Martin trouble in 2017. He notched 67 total pressures including the playoffs and averaged more than five total pressures per game in the postseason while also being a formidable run defender. In a crowded position group in today’s league, Cox is still a standout. Graham has had the two best years of his career over the past two seasons. As part of the most dominant defensive front in football last year, Graham notched 78 total pressures in 2017 including the playoffs to go with the 83 he had the season before. He backed up his overall PFF grade of 93.9 in 2016 with one of 91.6 last season en route to a Super Bowl win. Graham also finally saw his relentless pressure turn into a double-digit sack season, notching 11 in the regular season. Still angling for that long-term contract, Bell remains one of the biggest matchup weapons in the game. 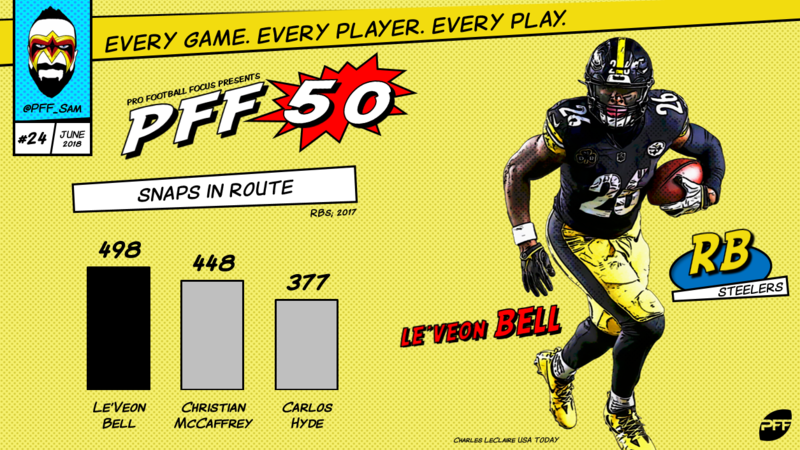 A unique ball carrier who can influence the leverage of defenders and help to generate his own running lanes, Bell is also one of the best receiving backs in football and has seen 394 targets come his way over his career, including 112 in 2017. He has broken 100 tackles over the past two seasons on the ground and another 35 as a receiver, becoming a vital part of the Steelers’ high-octane offense. Short has now had three straight seasons over 90.0 in overall PFF grade and has really elevated himself into the elite at his position. Another player whose stock would likely be higher if not for Aaron Donald redefining what people thought was possible for defensive tackles, Short has been a one-man wrecking crew inside for the Panthers. Over that three-season span, he has averaged 61.3 total pressures and more than 30 defensive stops, dominating both the ground game and as a pass-rusher. The league’s best free safety – Thomas has a devastating combination of range needed to influence plays while manning the deep middle of the field and the instincts to set off early and get involved without lining up too far off the line. He is the player that makes that defensive scheme work and notched four pass breakups to go along with two interceptions in 2017. The year before, Thomas wasn’t in primary coverage for a completion longer than 16 yards down field and he had five pass breakups to go with another two interceptions. 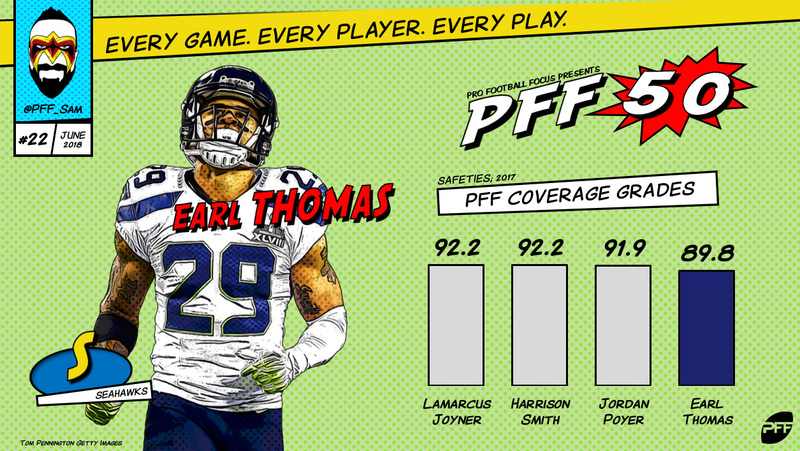 A healthy Thomas is a game-changing weapon for the Seahawks’ defense. 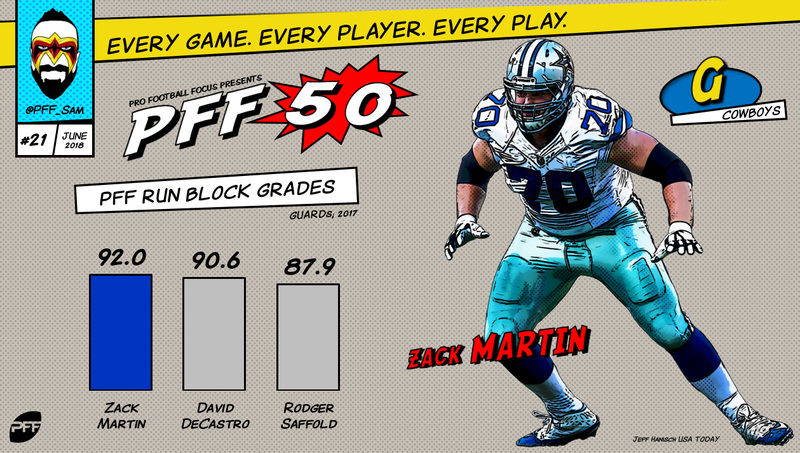 The consistency of Martin in the NFL has been remarkable – beginning his career with an overall PFF grade of 85.9 as a rookie and elevating that to 92.2 in 2017 without ever dropping below in between. Last season, he was a force for the Cowboys and arguably the best player on that offensive line, surrendering just one sack and 11 total pressures over the season while crushing defenders in the run game. He has now played 4,387 snaps on offense over his four-year career. 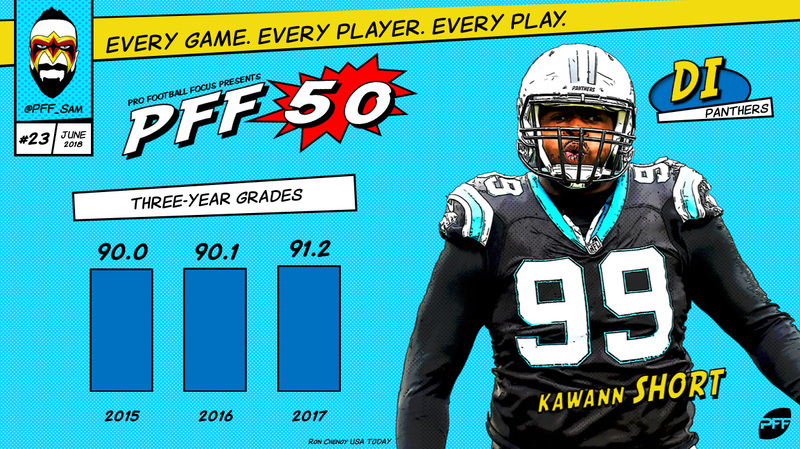 A major knee injury threatened to derail the career of Atkins when he was the best pass-rushing defensive tackle in the game, and while he has never quite returned to that stellar 2012 level (96.4 overall grade), he has gotten pretty close with two seasons in the past three over 90.0 in PFF grade. Among interior linemen, only Aaron Donald generated more total pressures than the 70 Atkins managed in 2017 and he now has 233 total pressures over the past three years, which also trails only Donald among interior linemen. One of the best interior defensive linemen in the game became one of the best edge rushers in the game with an offseason move a season ago that brought with it a change in position. Seemingly, whatever you ask him to do, it appears Campbell is one of the best defenders in the game. 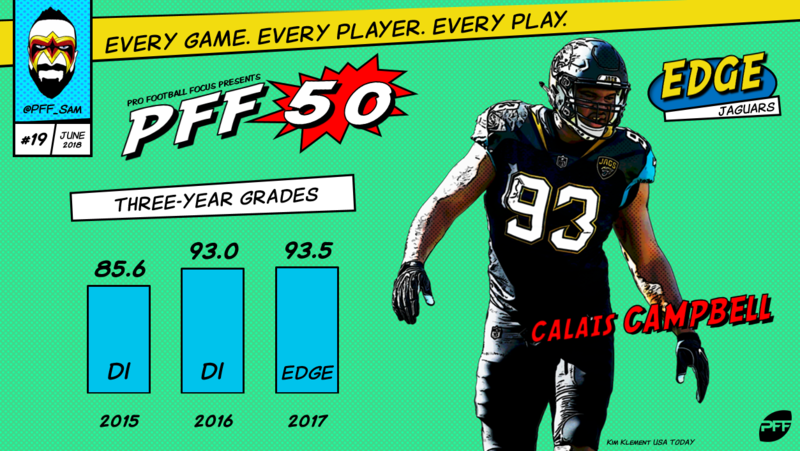 In 2016, Campbell had the second-best overall PFF grade (93.0), trailing only Aaron Donald, and then when he became an edge rusher for the Jaguars, he finished with a 93.5 overall grade and notched 73 total pressures. Collins struggled terribly as a rookie, but a position switch in Year 2 saw him immediately transform into a Defensive Player of the Year candidate as he manned his natural position of strong safety. His 92.5 grade that season was backed up by one of 88.5 in 2017 despite the Giants’ defense as a whole and secondary in particular collapsing around him. Collins has 83 defensive stops over the past two seasons – tackles that constitute an offensive failure on the play – which is the most of any safety by a considerable margin. Ramsey ended his rookie season on a tear, registering nine pass breakups and two interceptions in his final five games. Year 2 saw him emerge as one of the best corners in football with seven games in which he surrendered fewer than 20 receiving yards. Ramsey has graded well against the run over his two years in the NFL and brings an aggressive physical streak, one that antagonized A.J. Green into losing control of himself and starting a fight between both players. Ramsey’s potential still remains pretty limitless. 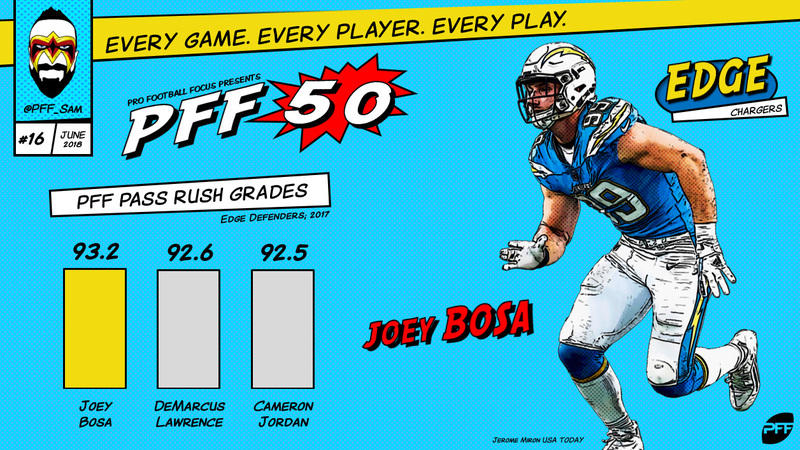 One of the stars of PFF’s first seasons of grading college football, Bosa picked up where he left off in the NFL like there was no step up in competition. Bosa is now one of the game’s premier edge defenders, notching more total pressures (134) over his first two years in the league than any other player in the PFF era, despite missing the first four games of his career. 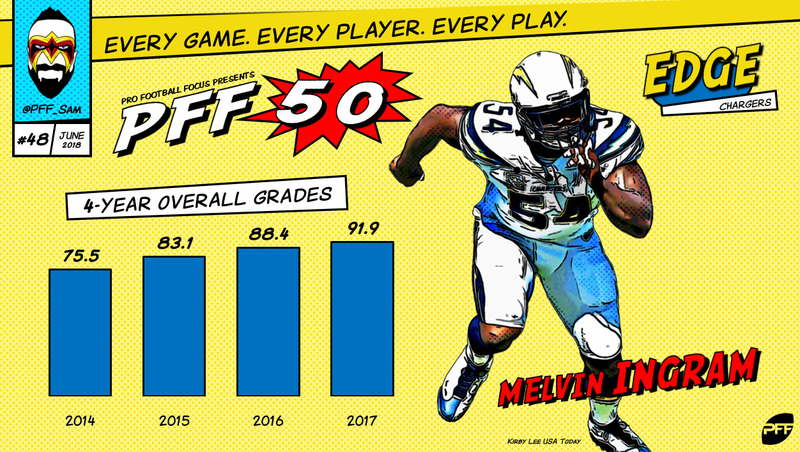 Bosa has been a capable run defender as well, but together with Melvin Ingram on the edge, the Chargers defense is capable of changing games as a pass-rushing unit. 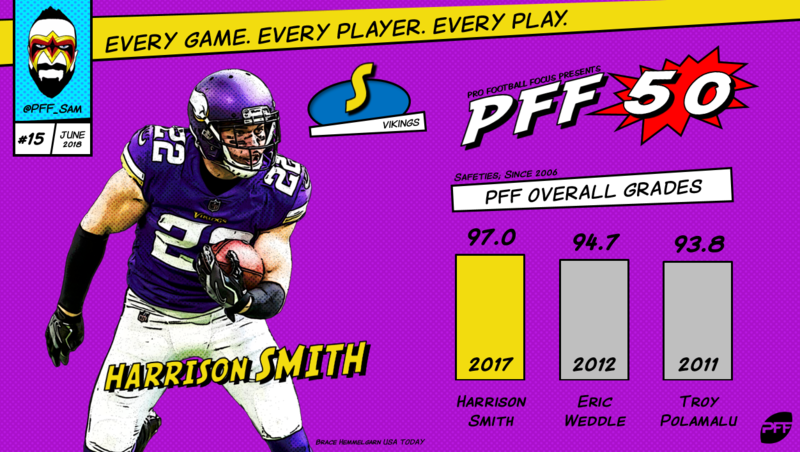 In 2017, Smith didn’t just post the highest grade of any safety in the game (97.0), he posted the highest single-season grade we have ever seen from a player at that position since PFF has been grading every snap of every NFL game (2006). Smith graded well in all facets of the game and has a complete skillset that allows the Vikings’ defense to play any scheme they want on a play-by-play basis, knowing that they have the shape-shifting keystone on which to build the rest of the defense. 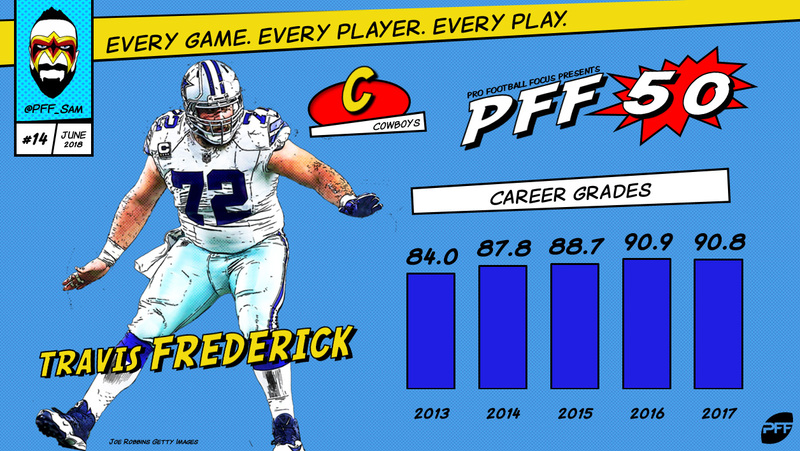 Consistently the best center in the game, Frederick anchors the Dallas offensive line and not only plays as well as any center in the game but may be asked to execute the toughest assignments of any center in football within the Dallas scheme. His run-blocking is peerless, but he can show off some pretty impressive pass-blocking statistics too, having surrendered just one sack over the past four years and none for three consecutive seasons. Jordan has quietly become one of the best defenders in the game. Early in his career, he was something of a tweener who needed a specific role to play at his best, but he has developed into a monster anywhere along the defensive line. He had 74 total pressures during the regular season, before adding another 13 in the playoffs and dominating the Minnesota Vikings in the Divisional Round only to fall victim of the ‘Minneapolis Miracle.’ 2017 marked the third straight year that he has recorded at least 50 hurries. He also led the league in batted passes at 12 including the postseason. Wagner missed just three tackles during the entire 2017 season, and all three came in the final three weeks of the season when he was battling through injury and playing hurt. Before that, he was having a Defensive Player of the Year type season and doing so while the rest of the Seattle defense was collapsing around him and other stalwarts missing significant time due to injury. 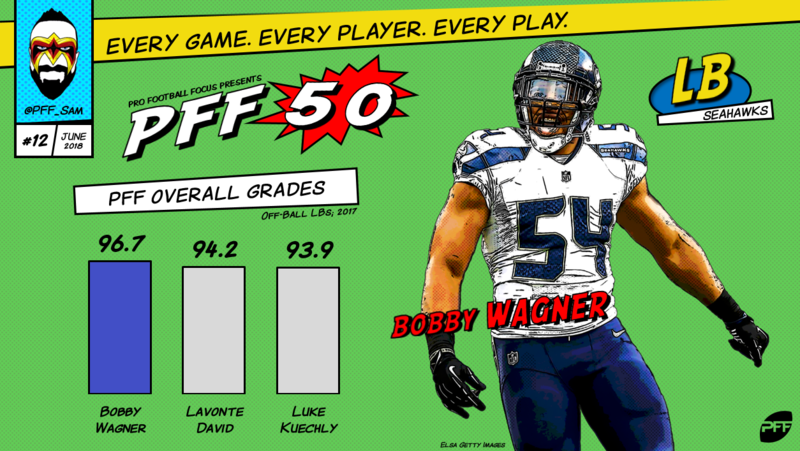 The speed with which Wagner is able to diagnose plays and take steps to combat them is rare and he has averaged 61.3 defensive stops per season in the NFL. Hayward is an example of a player that has consistently outperformed expectations from Day 1 in the league. His 2012 rookie season was one of the best years we have seen from a first-year corner and when he got the opportunity to start, he took his game to another level before taking yet another step in 2017 when he became the No. 1 corner for the Chargers. He responded by finishing the year with the top overall PFF grade among all corners (96.5). That grade wasn’t just the best mark of any corner in 2017 but is the second-highest grade we have ever given a corner trailing only the otherworldly 2009 season from Darrelle Revis. Nothing showed the kind of impact Rodgers has on his Packers than last season when he got injured and the team was forced to turn to Brett Hundley. 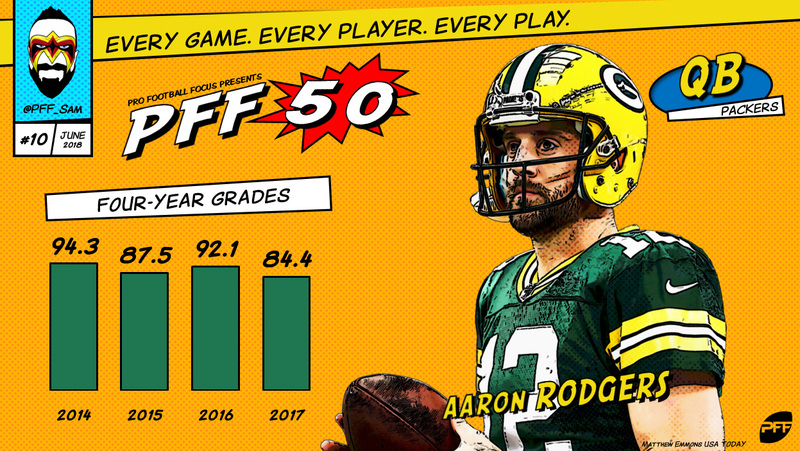 Rodgers is one of the best quarterbacks in the game and has five seasons in his career with an overall PFF grade higher than 90.0. He has no equal when it comes to manipulating the opposing pass-rush with his movement in the pocket and actually aiding his pass protection despite holding onto the ball on average longer than all but one other quarterback (Tyrod Taylor). Coming off a broken leg, Yanda played just 102 snaps in 2017 before being lost for the year, but those 102 snaps were the same dominant display we have become accustomed to from the league’s best offensive lineman. 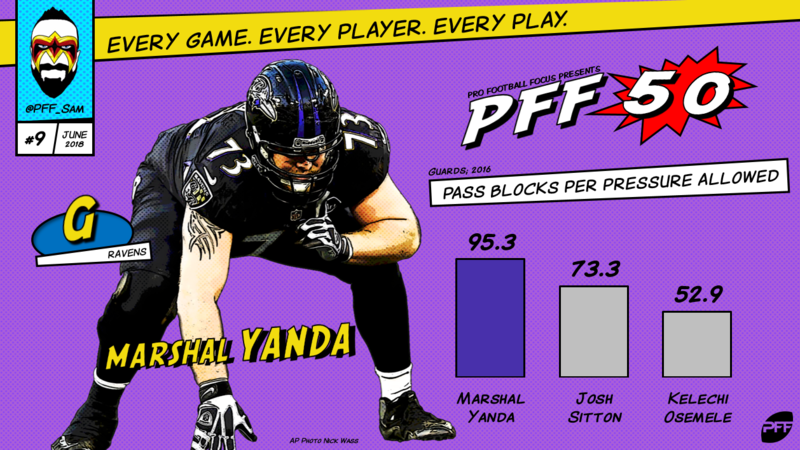 Yanda has outstanding NFL tape at three different positions along the line (both guard spots and right tackle) and has only surrendered one sack since the start of the 2015 season. Yanda remains one of the most underrated players in the game because he plays an unglamorous position, but there are few more consistent, and consistently outstanding players in the league today. Miller’s career PFF grades are just a wall of elite-level numbers. 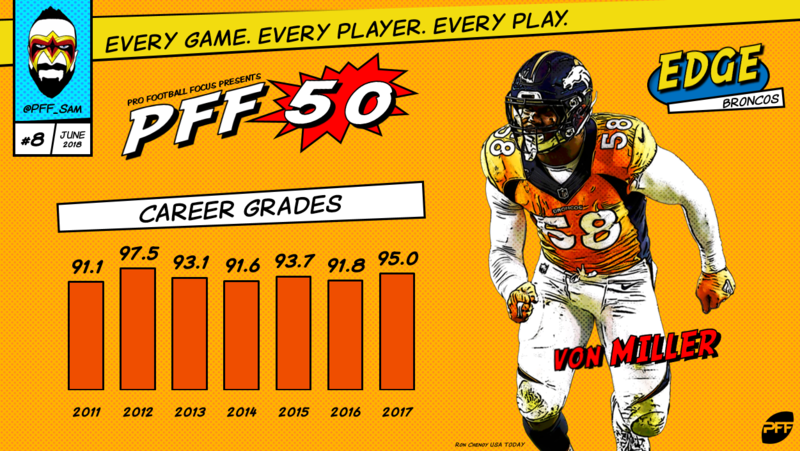 He has graded above 90.0 every season of his career. 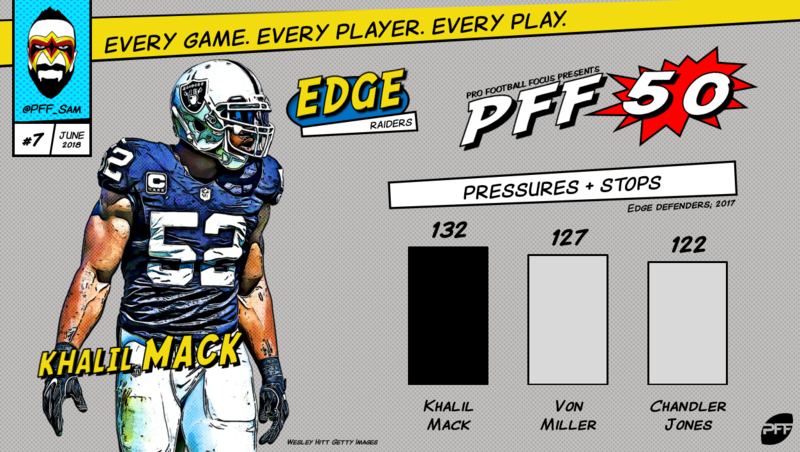 Only 22 edge rushers have posted a single-season PFF grade above 90.0, and Miller has done it seven times, in consecutive seasons, every year of his career. This past season, he notched 10 sacks, 12 hits and 61 hurries to still lead all edge rushers in total pressures despite the Denver defense around him taking a step backwards and his sack total belying the elite pass-rush he still brought to the table. Much the same way as Julio Jones and Antonio Brown are difficult to separate as the best receiver in the game, the same holds true for Mack and Miller, with the added spice that they both play in the same division. Mack notched 79 total pressures and led the league among edge defenders with 53 defensive stops. He is dominant on the edge as a rusher and a run defender, and has done it without a huge amount of help up front on that Raiders defense. Mack and Miller were tough to separate a season ago and last season only made their comparison a closer one. There may be no tougher cover in the game than Gronkowski, who is single-handedly capable of breaking defensive game plans (as the Steelers found out to their cost last year). Injuries have been a factor throughout his career and his durability remains a minor concern, which is realistically the only thing keeping him away from the very top spots on this list. 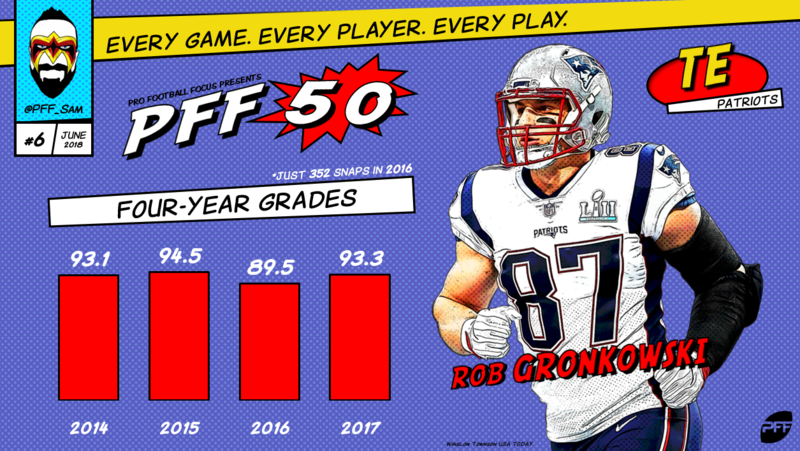 There is no more dominant force on offense than Gronkowski as he had an overall PFF grade of 93.3 last season – the only TE above 90.0 – and now owns five of the six highest grades we have ever given a tight end. Kuechly is the game’s most complete and versatile linebacker, which also helps make him the best. 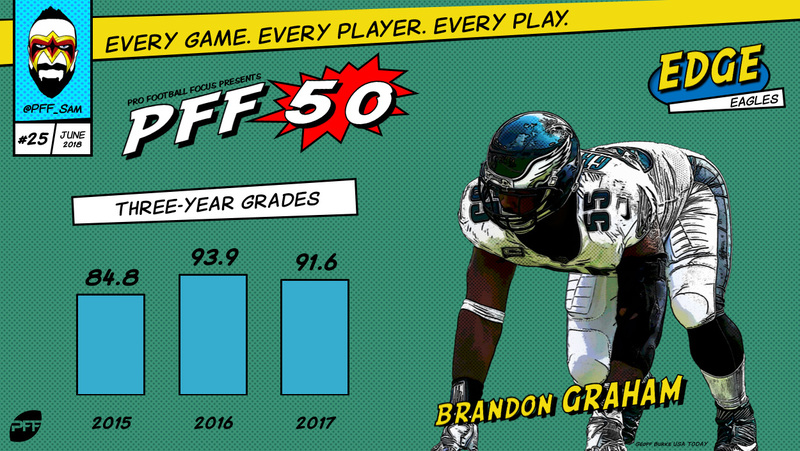 The only negative in his game over the past few seasons was injuries (concussions, specifically), but he played 95.9 percent of the team’s defensive snaps in 2017 and graded well in every facet of the game. 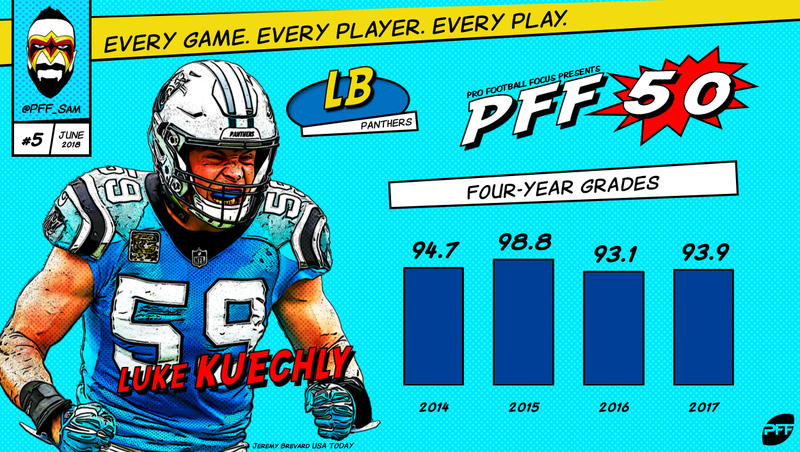 Few players are capable of reading the game and impacting the play as much as Kuechly and he makes plays that you just don’t typically see from linebackers. He is one of the best players in the entire game and remains the gold standard for linebackers. Julio Jones and Brown are incredibly different receivers but are virtually inseparable in terms of performance and ability. Brown had an overall PFF grade of 93.7 in 2017 – the best mark in the league – and has had four seasons in the last five years above that elite 90.0 threshold. Only Landry Jones prevented his 2016 season from making it five straight, dragging him down to an overall 89.6 grade that year. Brown gained 2.87 yards per route run last season, trailing only Jones (3.08). Marshon Lattimore wasn’t beaten for more than 38 yards in a game last season outside of when he had to cover Jones. In two games against Atlanta, he surrendered 220 yards. That’s the kind of impact Jones can have as a truly game-changing weapon. 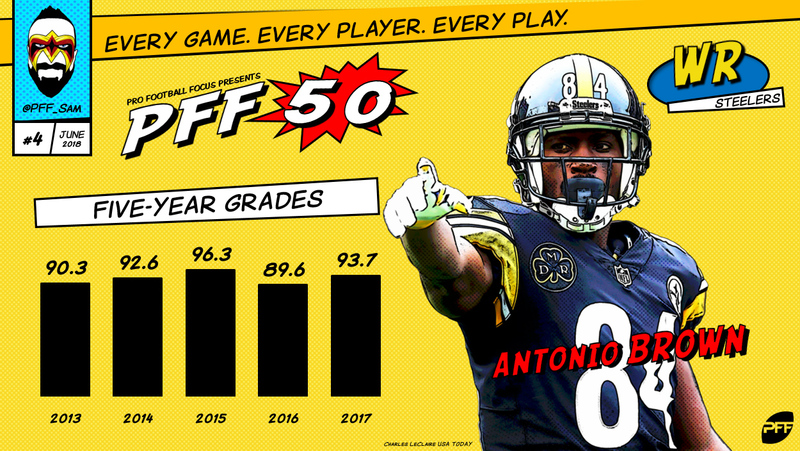 He is coming off his third straight overall PFF grade above 90.0, and while you can argue the merits of other receivers being better in 2017, none have been able to match his three-year stretch of production and grading. 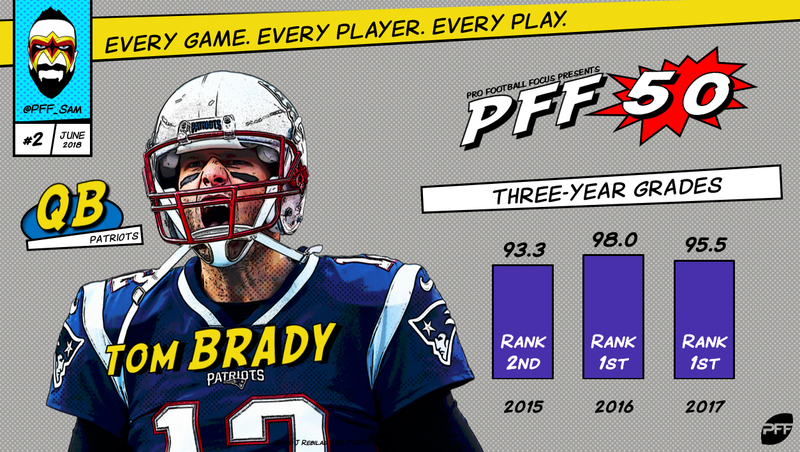 The top-graded quarterback in each of his last two seasons, Brady has gotten better with age and his strong performances have carried all the way through the playoffs. Last season, he attacked down the field more than he had in recent years, ranking second in the league in deep-pass accuracy while maintaining his usual excellent accuracy to all levels of the field. Brady ranked third in the league in big-time throw percentage in 2017 while finishing fourth at avoiding turnover-worthy plays, capping his third straight year grading at an elite level of 90.0-plus. The No. 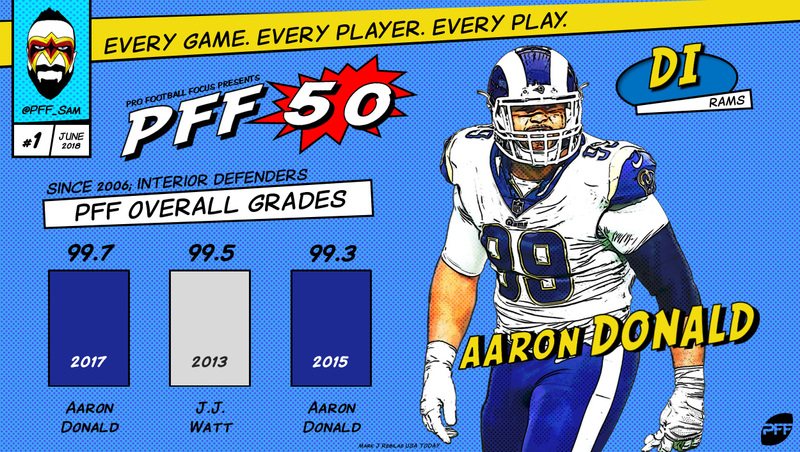 1 player on the list a year ago, somehow Donald has only gotten better for the Rams, and he may be in an even better situation heading into 2018 with additions like Suh to the defensive line. Donald led the league in total pressures (91) in 2017, despite playing only 14 games and doing it from a predominantly inside alignment. 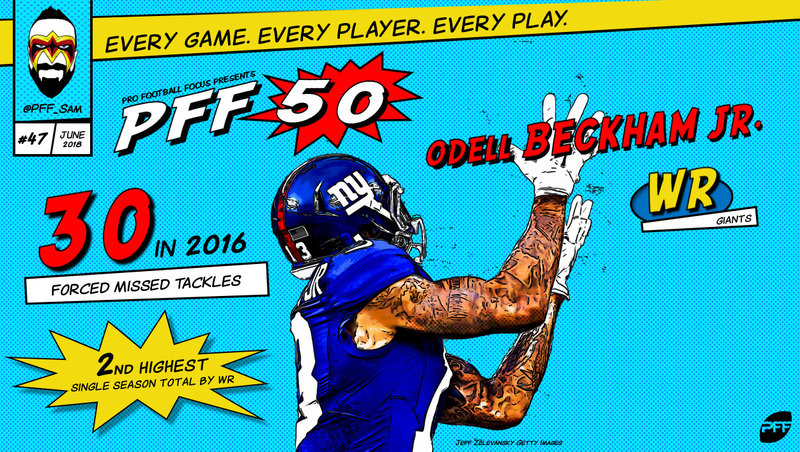 Donald is the best player in football right now and practically unblockable when it comes to generating pressure. 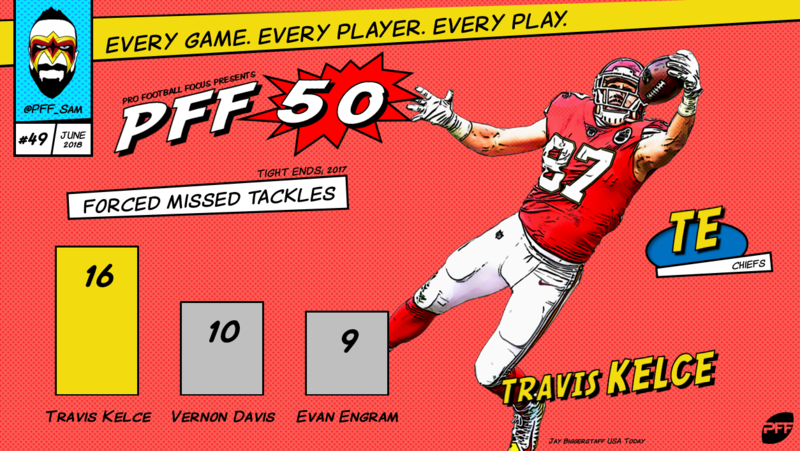 Subscribe to our PFF YouTube channel for more content including our daily videos that recapped the release of each day’s 10 athletes on this list.